Could the Germans have won the battle of Kursk? With what forces did Model begin the battle of Kursk? No sane military leader expects to win an attack against dug in troops with less than a three to one advantage in men and weapons. The Germans planned this attack knowing they did not even have a parity in forces, and in some cases were heavily outnumbered. So why did they think they could win? Mr. Zamulin goes into all the details of Army Group Center and Army Group South in the attack. He considers all of the variables and comes to the conclusion that if 'Operation Citadel' was launched earlier in April or May the Germans would still have lost. I believe that he is probably correct, but the answer lies not in numbers or trenches, but in hubris. Until 1943, the Germans trounced the Russians whenever the weather was warm. On the German side, I believe that they thought they lost in 1941 and 1942 to 'General winter', and not exclusively to the Russians. With the Japanese in the Pacific, the term was coined 'Victory Disease'. I think the German plan for Kursk showed that they suffered from the same virus. This book is standard fare for a Helion & Company volume, meaning that it is an excellent work with eight pages of colored maps and many pictures from during the war. The author is as meticulous with his writing as with his figures and statistics. Anyone looking for what actually happened at Kursk without the legends and stories should look no further than this work and the author's 'Demolishing the Myth'. These books should be required reading for anyone who wants to know the real truth about the battle of Kursk. 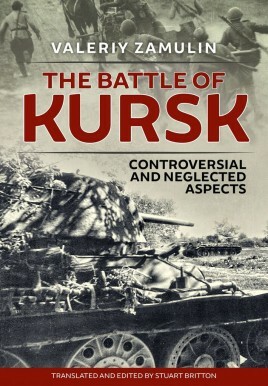 In 2018 he will be publishing a third book about Kursk, 'The Forgotten Battle of the Kursk Salient', about Army Group Kempf's offensive.